An easy and elegant dinner! 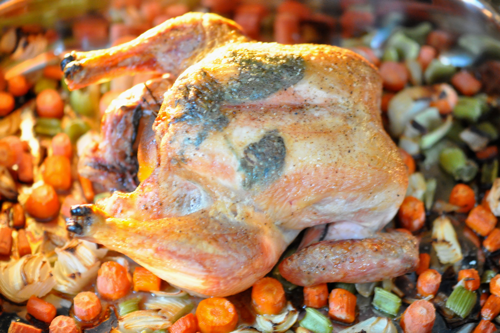 Roast chicken is an amazing food that makes a beautiful presentation. It is super simple to make and the flavor possibilities are endless! Here is the way that I make roast chicken frequently, but feel free to change it to your preferences. Preheat oven to 450F. Place half a lemon, 1 onion cut in half in the cavity of the chicken. Place the herbs underneath skin of the breasts. Coat skin with olive oil and season with salt and pepper. Place on a bed of celery, onion and carrots. Cook chicken to at least 160F. It needs to cook for about an hour and half or so. 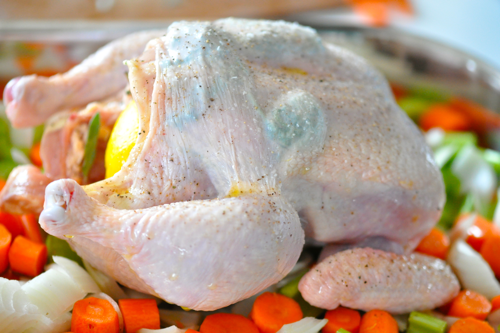 Let the chicken rest for twenty minutes, in order to continue cooking the chicken. The temperature will continue to raise to 165F. This will allows the juices to redistribute giving you a juicy chicken breast or thigh. Enjoy this wonderful dish and impress your guests! Winter is a beautiful time of year in Ohio; the snow is covering the streets and trees. Everyone is trying to keep warm in their winter jackets, gloves and hats. On top of that, homes are filled with warming soups and roasts. Its the best time of year for the richer and heavier foods to fill you up. There is so many marvelous foods in the winter. I love the different kinds of citrus, which brighten up the bitter cold months of the year. They add wonderful color to a variety of dishes and have many health benefits as well. Pick yourself up with these glorious foods and make some seasonal dishes that are pleasing to the eye and the taste buds.